Recently I was sewing a robe for my oldest daughter. She asked if she could help and said she wanted to learn how to sew. 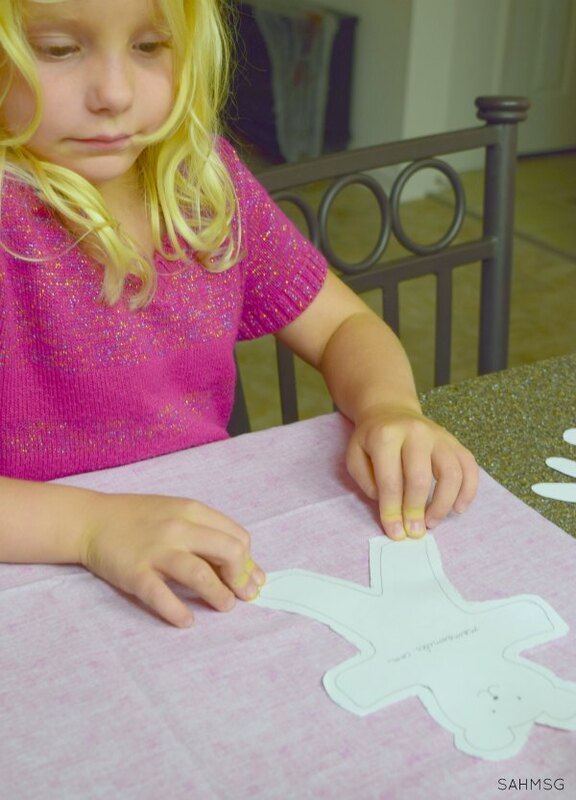 Before jumping in, I wanted to look for a project to help with teaching children to sew. As a child, I remember my mom sitting at her sewing machine. She still has the same one. It had its own table that the sewing machine folded down into for storage. The seat was little and could store spools of thread inside the seat. She sewed Halloween costumes, hemmed pants, and put plenty of patches onto my brother’s jeans to keep them wearable until he grew out of them. It was thrifty, and it took skill. The hum and whirr of the machine was soothing. I wished I could sew like that. A few times when I was around 10 or so, my mom let me try to sew a bit. 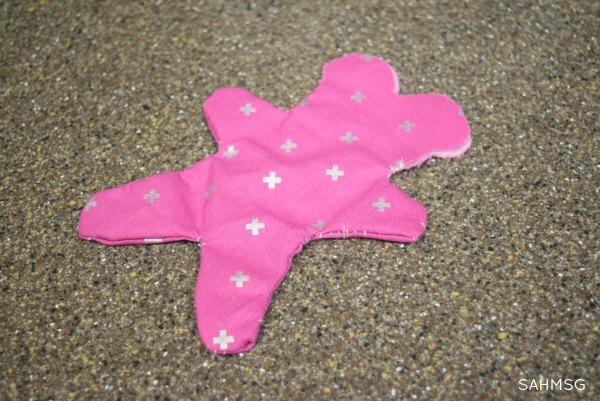 The first sewing project I completed was in a junior high school Life Skills class. 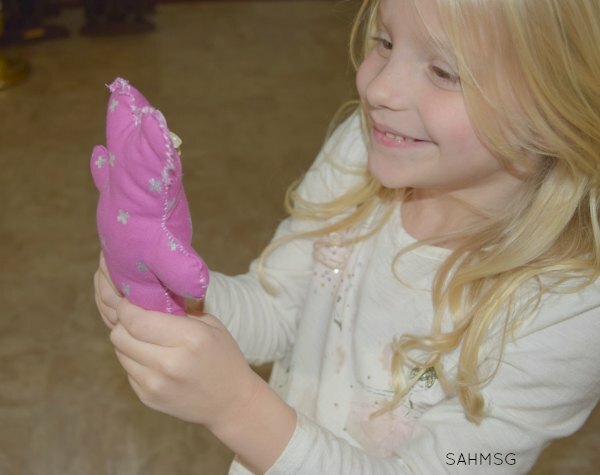 Teaching children to sew is not only a special activity, it is an important life skill. Over the past few years I have sewn my children’s Halloween costumes-the Frozen Elsa Coronation dress might be my best work yet. Following a pattern is all I can do. Hemming is easy too. I don’t feel I know everything about how to use my sewing machine, but when I need to use it I can. 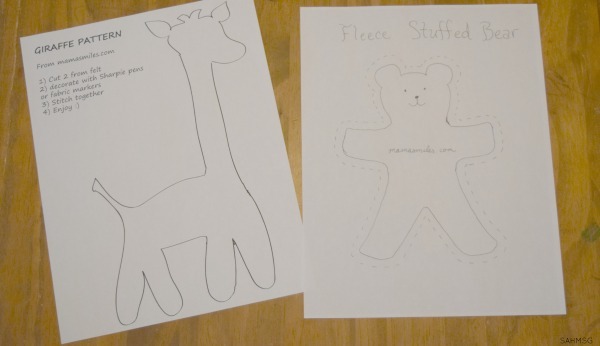 I found some cute patterns for teaching children to sew over at Mama Smiles Blog. 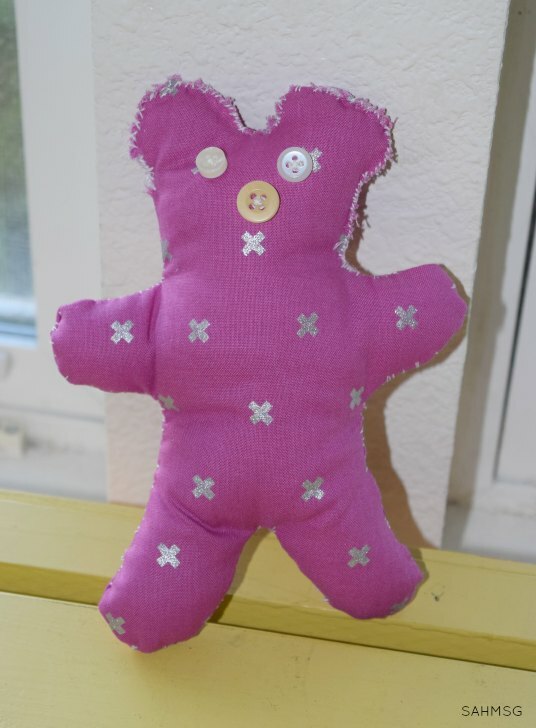 She is so crafty and has fun sewing patterns for stuffed toys available for free. 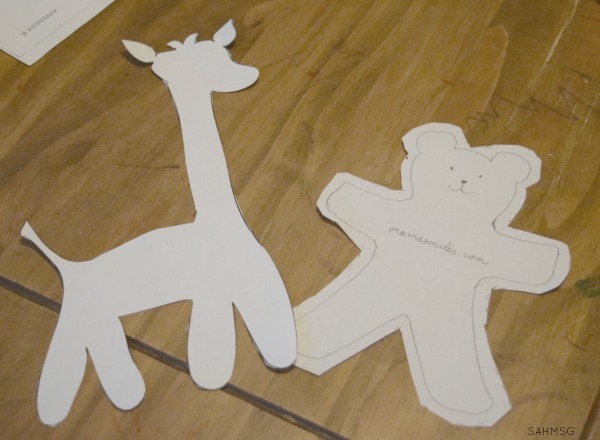 We chose the bear sewing pattern for our first sewing lesson together. To really make the whole process of teaching my daughter to sew exciting, we took a little shopping trip. 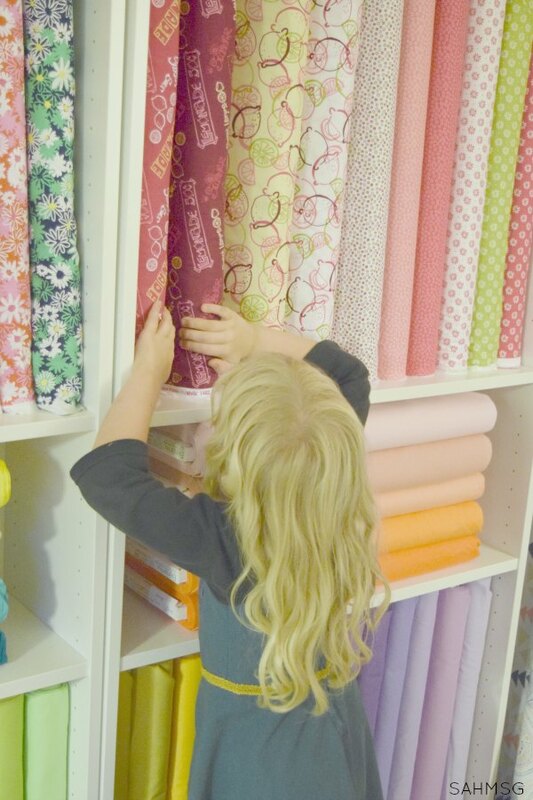 I brought my daughter along to pick out fabrics for our stuffed bear sewing project. My friend Brandi actually owns a fabric store. She is a stay-at-home mom who loves to sew custom purses and bags with really quality fabrics. 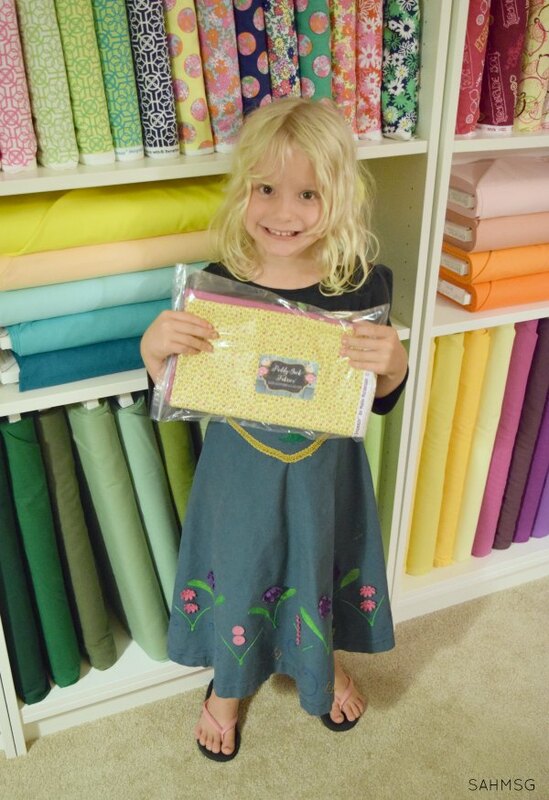 To follow this interest, she pursued her dream of owning a fabric store and now her home office/sewing room is the home of PaddyJack Fabrics. How cool is that? There are so many ways moms can work at home! PaddyJack Fabrics is on Etsy too, so you don’t have to be a San Diego local to grab some great fabrics. 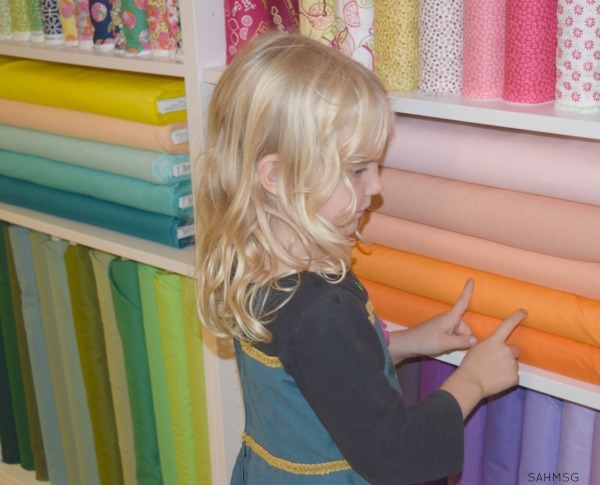 My daughter and I drove over to PaddyJack Fabrics (aka Brandi’s house) and we were blown away by the colors of the fabrics! They were so beautiful. My daughter may have been in bright color heaven! 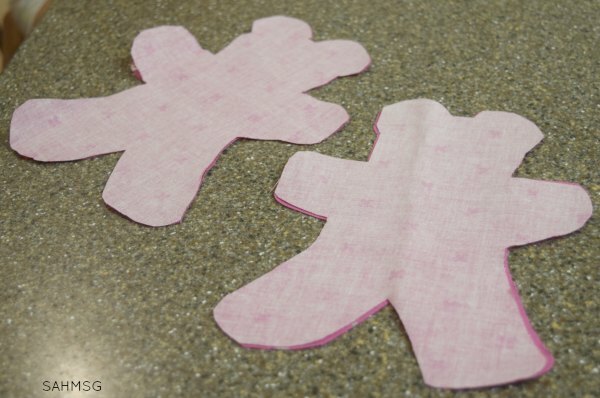 Since we planned to make a couple of stuffed bears and a couple of stuffed giraffes, I had Abby pick out two colors of fabric. She gravitated to yellow and pink. They are the favorite colors of the girls in our house. We were able to watch Brandi measure, cut and package up our fabric picks. It was a really special time for my daughter and me to have that one-on-one time together. We paid for our fabric, drove home, and of course she wanted to start right away. 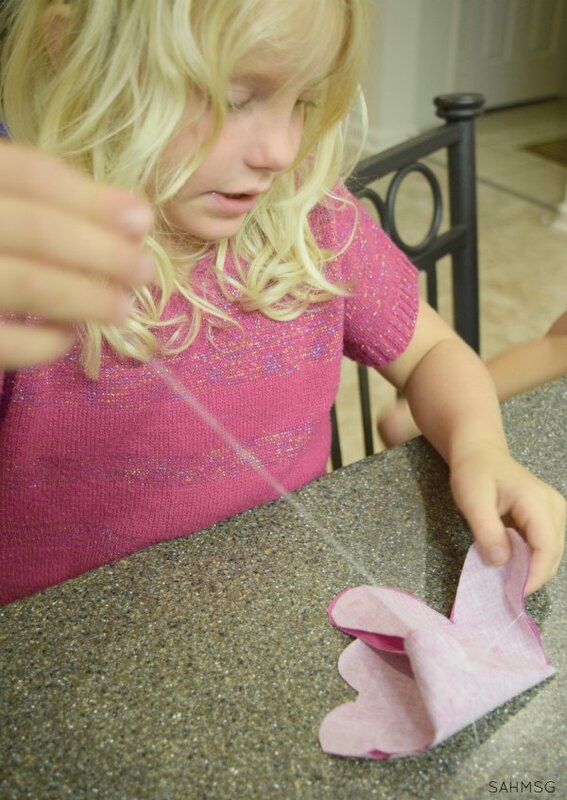 We had to spend a few different days on our little project for teaching children to sew. First I printed off the two patterns from Mama Smiles blog. The kids helped cut out the patterns. In the end I did a little trimming. 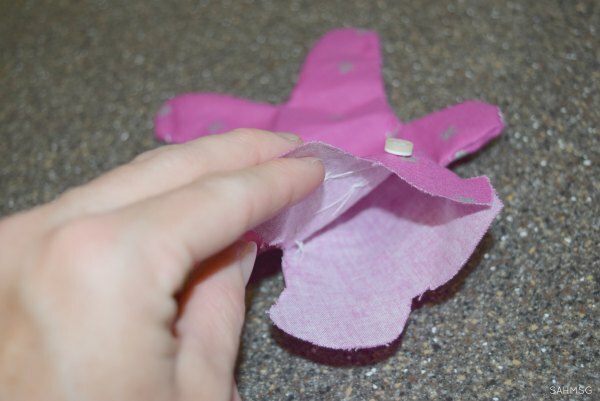 Then I showed the kids how to fold the fabric wrong side up to pin the pattern on and cut it out. Next, I showed her how to thread the needle. I made a couple of stitches as well so she could see how to start her sewing. She started sewing one set of fabric pieces together. She did a great job being patient and working her way around the bear. In the end, I had to go back around and stitch the entire project again to close any gaps, but for a first sewing lesson it went really well. This step took us a few days too. We worked on these when we could, and finally got them all sewed up except for the top of the bear’s head. We left an opening at the top of each bear to stuff it. I had a bag of Polyester Fill sitting around from an old project. We used that to stuff our two pink bears. Just before stuffing, my daughter requested a face for her bear. I have a bag of extra buttons. She picked two for the eyes and one for a nose. Before stuffing the bear, I sewed the buttons in place. After the bear was mostly stuffed, I had to sew up about 2/3 of the bear’s head to keep the stuffing in but give me more ability to finish stuffing before finishing the project. This is where you can see my lack of sewing skills! I just stitched the two pieces of fabric together using a whip stitch, but you could use more of a hidden stitch if you are a better seamstress than I. We got the bear all stitched together and the girls were ready for play time. Both daughters were thrilled with their “stuffy bears” as they call them. 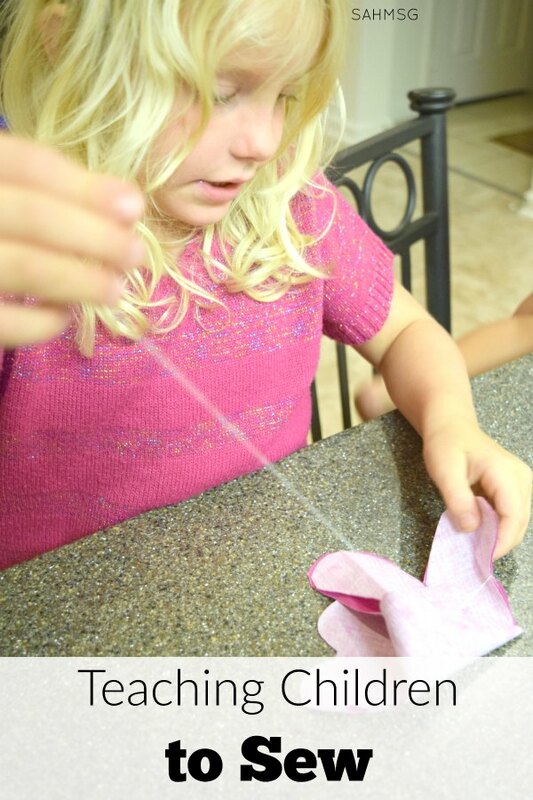 This is such a simple project that can be a great money-saving gift idea for kids too. Check out PaddyJack Fabrics and Brandi’s other store on Etsy LivStyles Boutique. The fabrics and tote bags are affordable and so cute. P.S.-This was not a paid post. I just want to encourage moms to teach their children life skills and support a friend’s business! 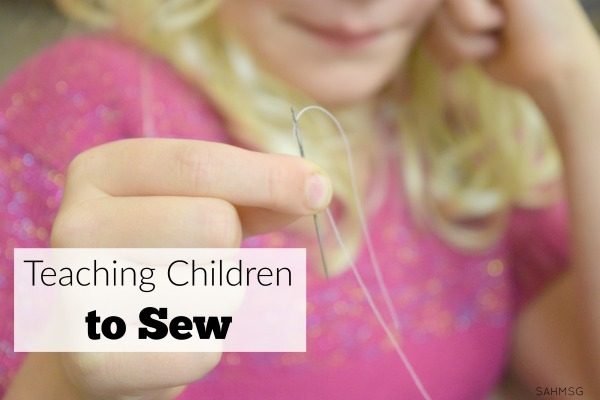 Have you tried teaching children to sew? What a cute stuffy bear! And yes I totally agree learning to sew is a great life skill and a really fun activity!! Thank you, and so true!